The oscillator section is based of 4000 series CMOS ICs. 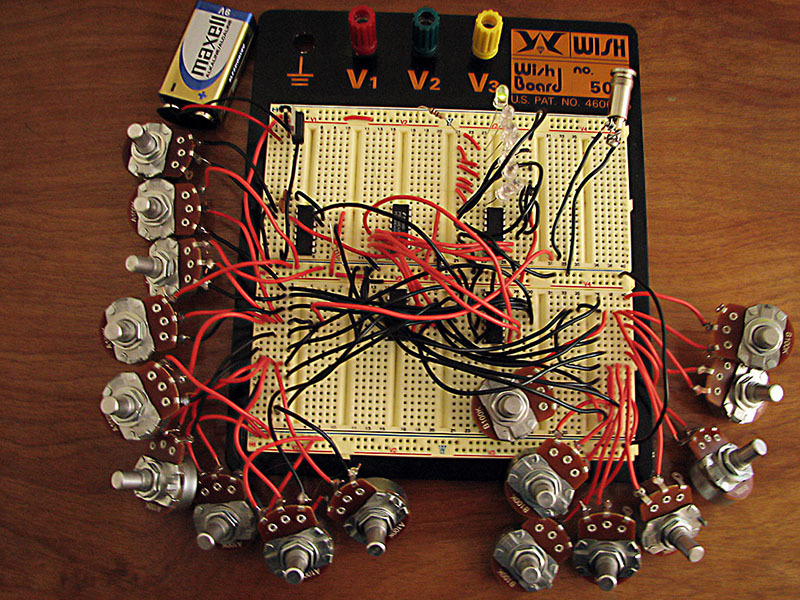 A 40106 forms a simple resistance controlled oscillator. 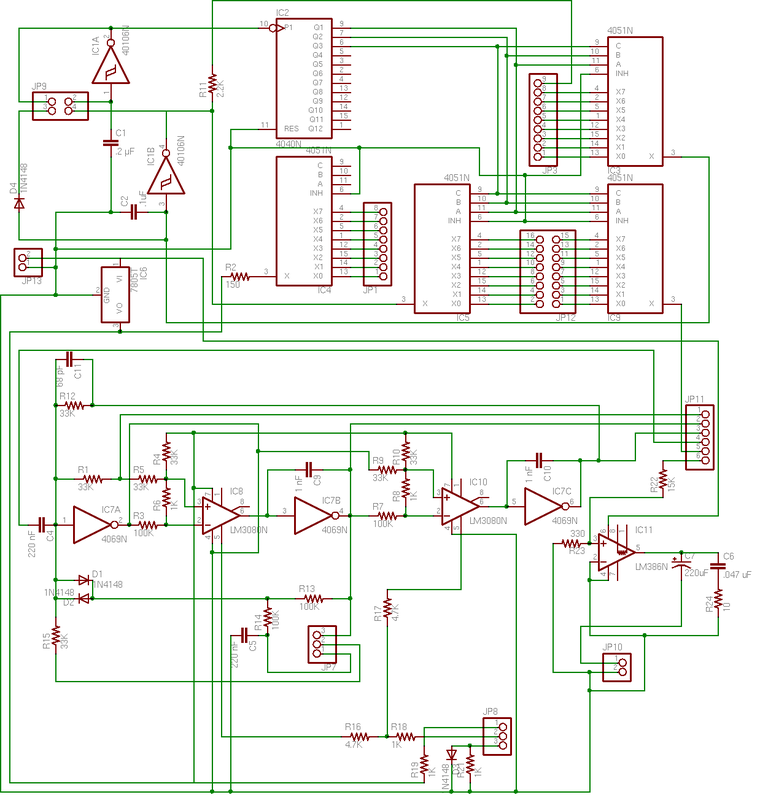 From there, a 4040 binary counter/divider divides the oscillator by 2 thrice, creating three slower oscillations. Those three new waveforms are piped into the control channels for an 8 bit multiplexer, the 4051. 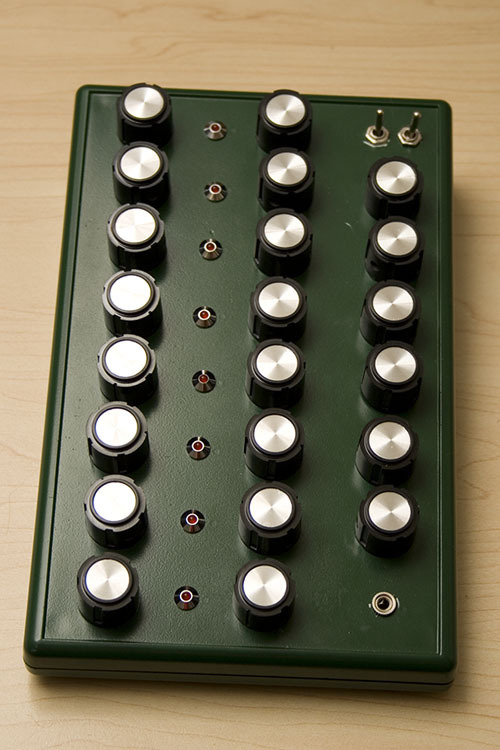 Three 4051s sequence through a set of eight different potentiometers, adjusting the pitch and volume on another 40106. The digital prototype was one of the easier parts to create, as it was simple to start small (with just a single oscillator), and progress from there. The analog development was much more difficult. I had originally intended to use a very simple analog filter, but that did not produce the results I had desired. After trying many different things, and with the help of Tim Stinchombe, I eventually settled on the EDP wasp filter, as it was designed to run off of the +5/+0 voltage I was using. The schematics that I used for creating this are from The Pixie, and are slightly modified so as to use potentiometers rather then CV inputs. The EDP wasp filter provides a lowpass, highpass and midpass filter, and is 100% analog. From a working analog prototype, the next logical step was to package it up in something nice. I bought a case from Hammond Manufacturing, and ordered a PCB to fit. After the PCB arrived, it took a couple of weeks to solder and assemble everything, and a frustrating few more to figure out why it still wasn't working. Here is a photo and a sample MP3 of the completed Squarecave. 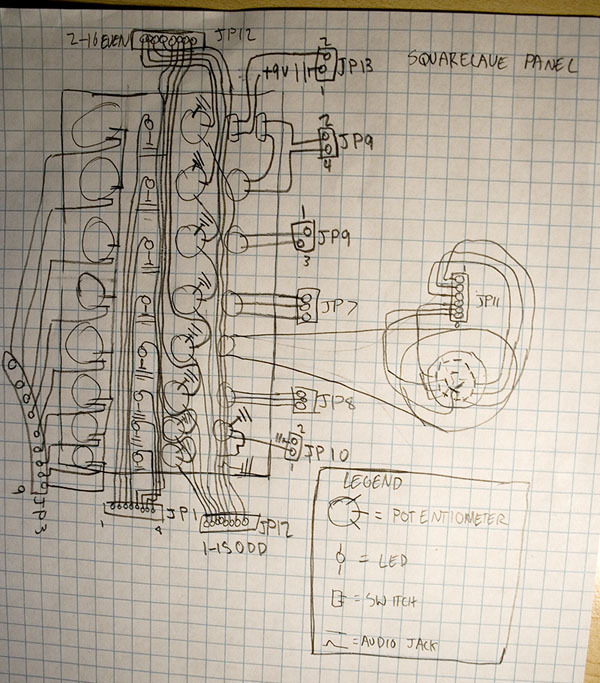 Note: the sample mp3 really isn't producing "the squarecave sound," for that, check out the video up above, of the breadboarded Squarecave. 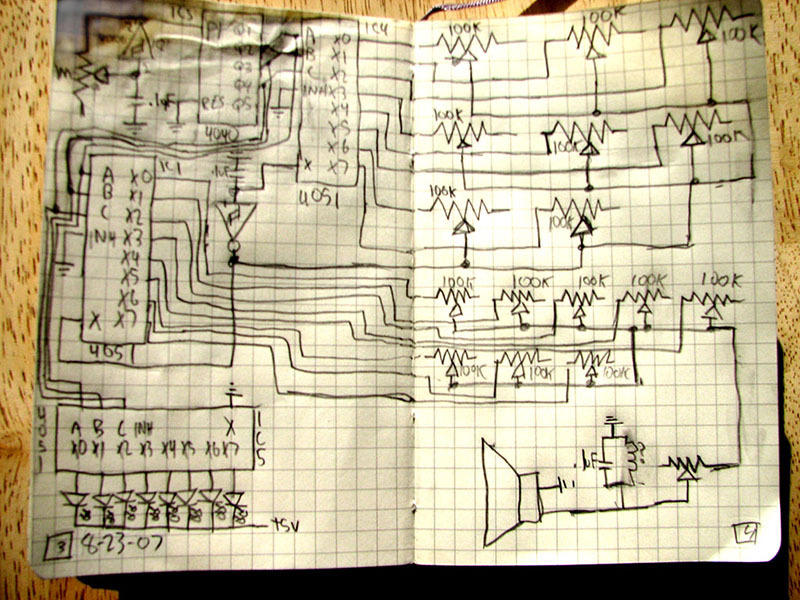 The schematic for this synthesizer is in PNG form below. 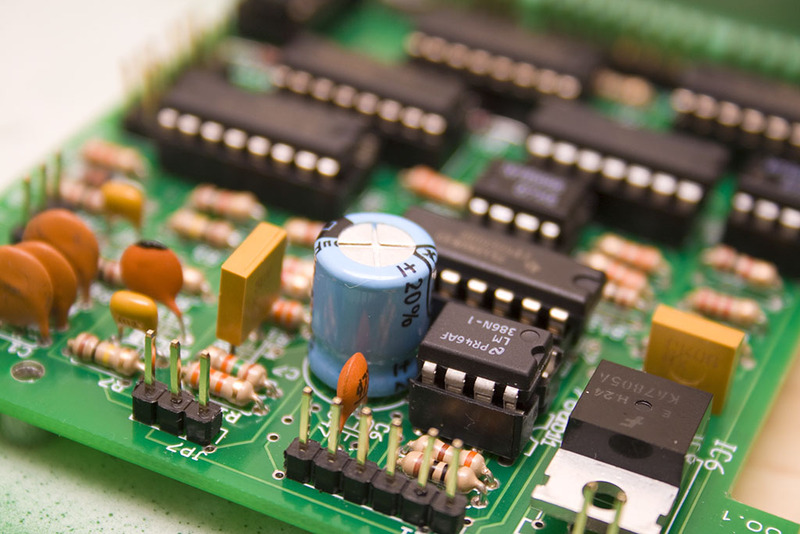 Information on the design of the digital and analog parts is available in the history. This is a revised version of the schematic; the built version photographed above is connected to the panel differently. This document shows how the panel of switches, LEDs and potentiometers connects to the circuit board. The panel mount does not have a board, and rather potentiometers are simply screwed down to the plastic and freewired to header housing. The panel is designed to be on an 8.66'' x 5.5'' case from Hammond Manufacturing. The diagram below shows how the panel is wired, and how it connects to the main PCB. (Diagram made with the latest CAD techniques) It is rather hard to follow, but the important part is how the potentiometers are wired to ground, and how they are connected to jumpers. The left 8 pots are all 100K linear, the middle 8 are 100K log, the top right pot is 1M log, the next one down is 10K linear, then 100K log, 4x3 rotary switch, then two more 100K logs. Revised schematic, as shown above (Eagle format) Note: untested. "Star Hate" (1): Your browser does not support the audio element. "Star Hate" (2): Your browser does not support the audio element. "Star Hate" (3): Your browser does not support the audio element. "The Bookstrip" (1): Your browser does not support the audio element. "The Bookstrip" (2): Your browser does not support the audio element.